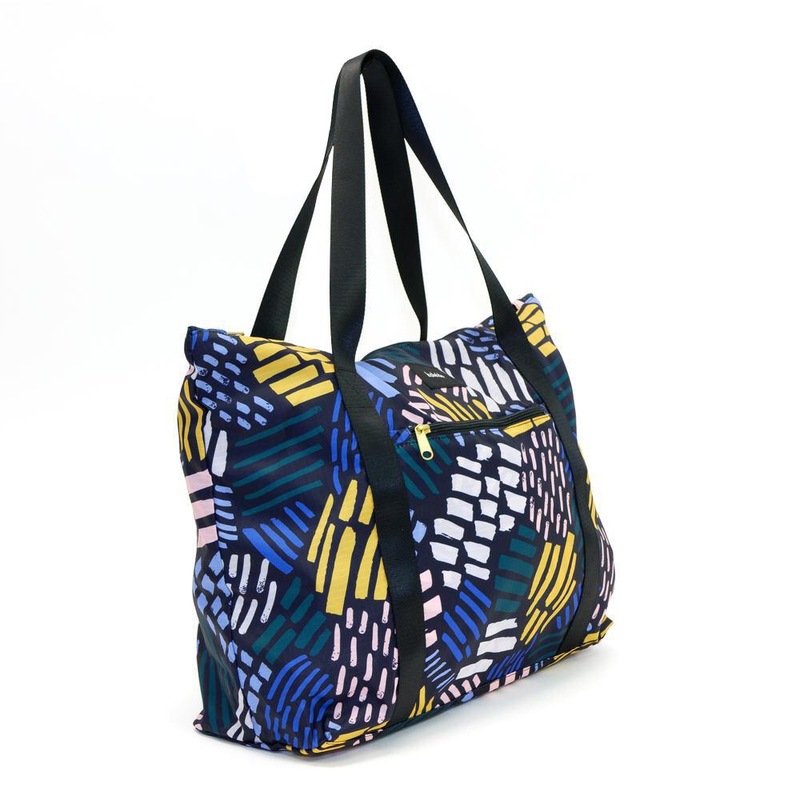 We love sharing new, awesome products that are being brought into the world, especially when we have the honor of helping design the patterns that go on them! So we are super excited to announce our first collection with Kaleido Concepts and their newest print, Midnight Muse! If you don't know about Kaleido yet, you're going to be glad you do now! 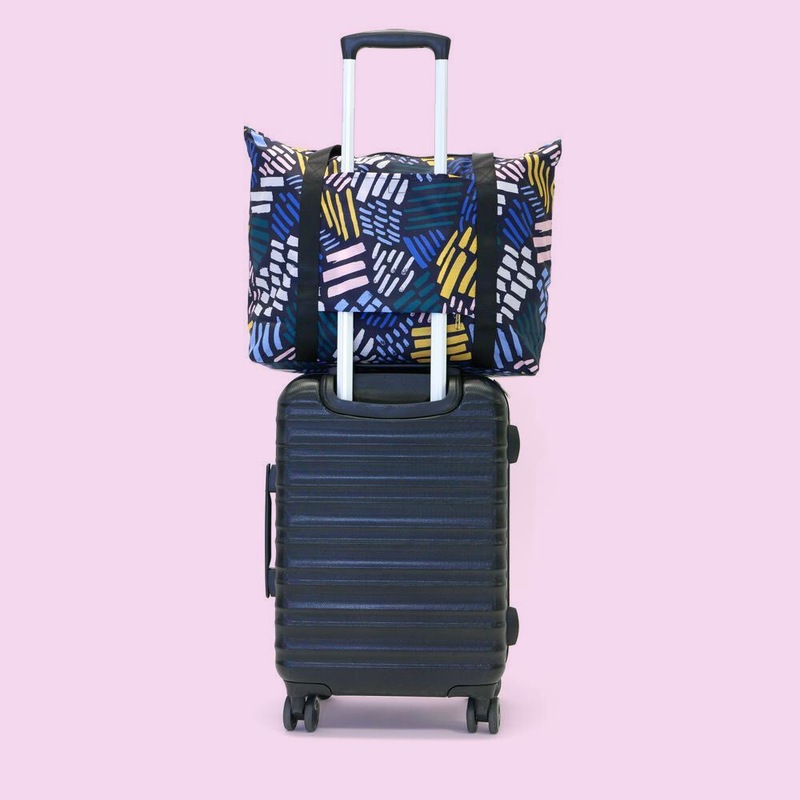 Who doesn't love stylish travel essentials that are lightweight, high-quality and, of course, super cute? The totes, backpacks and pouches are convertible and convenient for whenever you need it. They all easily fold into a small pouch that fits in your purse or pocket. And another amazing thing about Kaleido - with every product you purchase, Kaleido Concepts donates 1% of profits to children's literacy and girls' education. It seriously doesn't get better, right? Kaleido is now taking pre-orders on our brand new print, available in mid-August. Grab one and take us along on your next adventure! Also, our friends at Kaleido asked us a few questions to share on their blog and we thought we'd share them here too! We've gotta admit, we're not always the best about talking about ourselves. It's way more fun to talk about patterns and colors and rainbows, which of course we found a way to sneak into an answer below! Enjoy! OK, we really must know… How did you two meet? And how did you get started working together? Well, we believe that it was no coincidence that we actually first met in Typography class (clearly not knowing that many years later we'd start a company with a typographic symbol as our name)! We continued to study graphic design together at the University of Kansas School of Fine Arts and ended up being roommates during our semester abroad in England! After graduation, we both were hired by Hallmark Cards where we worked together for almost a decade chatting over cubicle walls. During our years at Hallmark, we held multiple positions including Designer, Art Director, and Creative Strategist where we designed and led various multi-million dollar collections and accounts! Then, in 2009, after freelancing together for several years, we finally followed a long-time dream to start a business creating patterns and artwork for modern, everyday living. Ampersand quickly became known for combining graphic and handmade marks to create bold patterns in refreshing color palettes. How do you complement each other, artistically & as business partners? Well, as we mentioned we are good friends from art school who turned into business partners, and we feel beyond lucky to create art together and call it our job!! One thing many people don't understand at first is that we are BOTH the artists!! Neither of us has a natural business mind so we've had to sort of learn that part as we go. We've organically just started to own different aspects of our business and divide up things like finances, contract approvals, social media, overall brand strategy, photo shoots, scheduling, etc. We think the business-side of owning a business will be an ongoing learning process for us forever! The whole creating art thing---that comes naturally! When you were creating this new pattern for Kaleido Concepts, what was your inspiration? Can you tell us a little about your process? We find inspiration literally everywhere we go—from the ceiling of a favorite restaurant to an accidental color palette from painted buildings placed next to each other. We like to experiment with different mediums but we always return to cut paper, pen & ink and paint! For this particular piece of art for Kaleido, we were playing with some new brushes and mimicking some patterns we were seeing in nature--in blades of grass, in tree bark, and fallen pine tree needles. We collaborate and sit together while we create, frequently passing the art back and forth between each other. Sometimes one of us starts a piece and hands off to the other one for color or vice versa. Ampersand is a true joining of both of our work as one! We like to joke that we never grew out of that whole rainbow-loving phase from our childhood in the 1980s. Our art is frequently full of bright, fun and bold color! What are some of your must-have travel essentials that you would carry in your Kaleido pouches? Both of us can't live without our One Love Organics Skin Savior Wonder Balm (we literally use it for everything--you can wash your face with it, use at moisturizer or lip balm and it's completely organic and safe for baby and kids' skin also)!. We always carry some form of little sketchbook to capture any inspiration that might catch our eye while traveling! Being in new places, seeing new things is one of our biggest inspirations! Where are your favorite places to travel with your families? And do you have any tips for traveling with kids? We live in Kansas City and one of our favorite places to travel with our families is Colorado! It's within driving distance, just around 8 hours for us, and it's the perfect place to visit in all seasons! Their summer is cooler than ours, so it's a great escape for hiking, mountain biking, alpine slide & roller coaster and of course, panning for gold! In the winter, it's the perfect snow skiing destination! We love planning trips with other families and meeting up on the mountain! Do you have any tips for traveling for business? When we get to travel for business, it's all about reading our own books and magazines on the plane, and let's be honest, trying to even sleep on the plane is a bit of a luxury for us! We like to plan any outfits in advance so we can pack light and carry on. We'd love to say we always pack comfortable shoes, but we'd be totally lying. One day we'll learn! When we are traveling with our portfolio books, we keep them practically chained to our bodies so they have no chance of getting lost with the checked bags! And...one thing we have forgotten once, but never again--always bring business cards!!! Carrie is a backpack girl. Morgan loves the tote!